Cruising, Sailing or Fishing - Garmin's GPSMAP 8610xsv is ready to provide top notch navigation and fishfinding capabilities! Designed around a 10" full HD IPS touchscreen display, the 8610xsv comes preloaded with Garmin Bluechart g3 U.S Coastal and LakeVu HD maps offering Navionics Data and Auto Guidance technology! Preloaded with Garmin BlueChart g3 coastal charts for the U.S, Canada and Bahamas and LakeVu g3 U.S. inland mapping with Navionics Data, the 8600 series offers unparalleled coverage and detail combining Garmin and Navionics content. Auto guidance is now included in each unit and calculates a route as well as a suggested path to follow. The 8600 series is compatible with Garmin BlueChart g3 Vision and LakeVu g3 Ultra chart cards (sold separately). The Garmin g3 Vision card is Garmins premier charting option. Simply select the region of your choice and gain access to enhanced imagery such as high resolution satellite coverage, crystal clear aerial photos and 3D views above and below the water line. 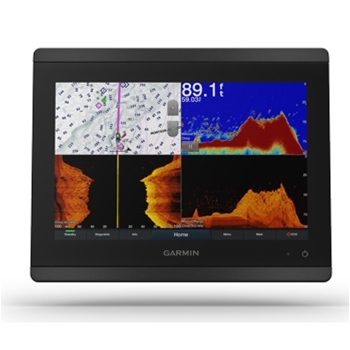 Garmin LakeVu g3 Ultra charting is Garmins premier freshwater charting and is offerred in both East and West regions. Dynamic Lake Level data, high resolition satellite imagery and surface and side scan sonar photos are some benefits of the LakeVu Ultra chart cards! Designed with complete Sonar support, the 8610xsv has an internal 1kW Dual Channel CHIRP Sonar with ClearVu and SideVu built in. With 1 LVS Sonar Port, 1 12Pin Sonar port and 1 8Pin Sonar port the transducer selections are nearly unlimited! Dependent on transducer selected, this unit can provide you with CHIRP, ClearVu and SideVu offering exceptional target separation and near photo like detail below and to the left and right of your vessel. It is also fully compatible with Garmin Panoptix transducers for all seeing sonar in real time. At the forefront of every 8610xsv is a 10" bright, sunlight viewable full HD IPS display for crisp clear images - whether you are looking at the preloaded charts, sonar, or any network component like a radar the images displayed will be superior in clarity and readability even while wearing polarized sunglasses. Fully networkable, this combination GPS/Fishfinder has 2 Garmin Marine Network ports for expanding your setup - add additional displays, radar, XM Weather, marine cameras (including the GC200 Marine Camera) and more. You can even add a GMS10 Port expander to add more than two network components. 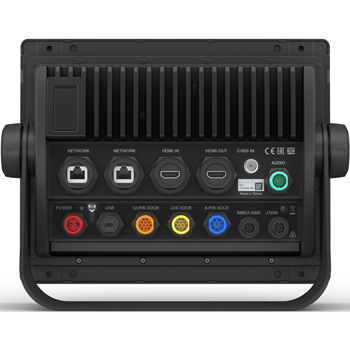 Each unit also includes NMEA2000 and NMEA0183 networking for connecting communication devices such as VHF or autopilot as well as 1 BNC Composite and 1 HDMI Video Input port and 1 HDMI Video Output port. The 8600 series also includes wireless connectivity for pairing with Garmin's ActiveCaptain app for access to OneChart, smart notifications, Garmin Quickdraw community data and even allows you to pair with your smartphone or table to pre-plan, update software, buy maps and even mirror your chartplotter for viewing and control right from your phone or tablet! IN addition to all these features, Garmin's exclusive OneHelm system works with many 3rd party onboard marine products to allow full control of digital switching, lighting, and more right on your display! Every sailor knows there is important data you just can’t go without, Garmin's SailAssist features have you covered! Providing data, displays and prerace guidance as well as laylines, enhanced wind rose, heading and course-over ground lines, When paired with compatible wind sensors, you also have a gauge that can quickly and accurately display true and apparent wind angle, set and drift, true or apparent wind speed, horizontal or vertical graphs and a customizable data bar. The Garmin 8600 series supports the Garmin inReach Mini Satellite Communicator which allows users to select from a list of preset responses to communicate with friends and family directly from your chartplotter. With all of these features and more, the GPSMAP 8600 series from Garmin is a top choice in network setups and will not disappoint! Garmin’s GMR Fantom 54 open array radar provides 50W of pulse compression power output combined with a 4’ open array antenna. The Fantom 54 includes MotionScope, True echo Trails and a detection range of 20’- 72 nm. Garmin’s Ultra High Definition Scanning Sonar system provides crisp images of fish and structure below and to the left and right of your boat when paired with appropriate GT34UHD Transom or Thru-Hull Transducer(s). Plug and Play with compatible units via Garmin Marine network. Garmin's GT24UHD-TM Transducer pairs with your Garmin GPSMAP 8400/8600xsv series and echoMAP Ultra GPS/Fishfinder to provide exceptional High Definition images of fish and structure below your vessel! The GT24 also provides accurate water temperatures. A full featured 12” combination GPS/Fishfinder with Sunlight viewable, Touchscreen display! 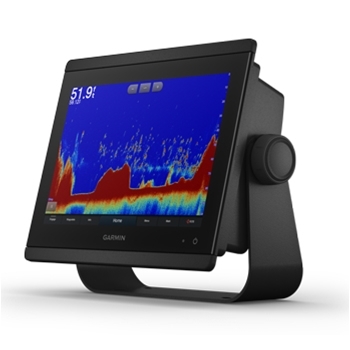 The 8612xsv from Garmin includes internal 1kW dual-channel CHIRP sonar with ClearVu and SideVu. Preloaded g3 Coastal and LakeVu g3 Maps. The Garmin 8610xsv Radar Bundle features the standard 8610xsv Combination GPS Fishfinder Network unit bundled with the Garmin GMR 18xHD Radar.